"I had a lot to learn. I was out of college, I was a 10K guy on the track and I thought the jump (to) the marathon shouldn't be too bad - I've run a half or two before. I had a lot to learn back in '05 to get me to where I am now." - Sergio Reyes on his marathon debut at the 2005 Twin Cities Marathon (a 59th-place finish in 2:38:04). Sunday, five years later at Twin Cities, it went much better for Sergio as he ran 24 minutes faster and picked up the 2010 USATF Marathon crown and $26,900. Seb coe avoids long runs??? 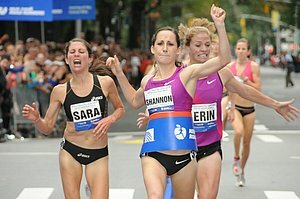 TORONTO MARATHON FEMALE 2ND PLACE SHOULD BE DISQUALIFIED!!!! San Jose: Meb Tunes Up For New York With 1:01:45 Win In San Jose This was a glorified training run for Meb as he had training partner Patrick Smyth with him for 10k and then was all alone. 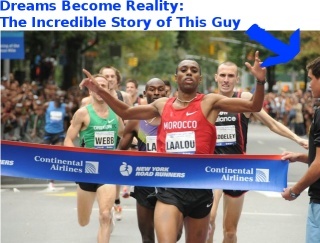 Up next for Meb - defending his ING NYC Marathon crown. Blake Russell won the women's crown and 49-year-old Linda Somers-Smith ran 1:13:31 for 2nd. After Much Concern, Commonwealth Games Open Spectacularly Video on the right. Prince Charles got to open the Games after all. Bolt To Start Training Again On Monday For 2011 He's in the Commonwealth but not running the Commonwealths ... but he could probably show up and win. Commonwealth Games A Prelude To Indian Olympics? 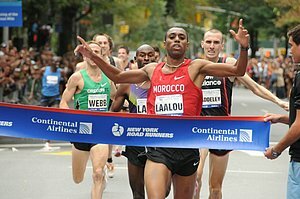 Past Champs Martin Lel, Dos Santos, Tulu Seek More Glory In NY Before missing his last three marathons due to injury, Lel might have been the best marathoner on the planet. This is big, big news (which we forgot to put up yesterday). Despite Negative Issues Plaguing Commonwealth Games, Kenyan Athletes Are Serious About The Actual Competition The article addresses Kenyan athletes in all sports, but Olympic steeple champ Brimin Kipruto is quoted. Kenyan Steeplers Are The Most Accomplished Athletes At Commonwealths World champ Ezekiel Kemboi thinks a steeple medal sweep is likely and reveals plans for a future in the marathon. A tally of ten Kenyan gold medals in all sports is apparently the benchmark for a productive Games, with the lion's share coming from T&F. Some Druggies Still Likely To Fall Through The Testing Cracks At Commonwealths Money keeps drug creators and suppliers in the game while fame and fortune keep athletes and agents willing to cheat. And WADA admits many dopers will continue to avoid detection. So what else is new? Athletes Allowed To Leave Opening Ceremonies Early Threats of an opening ceremonies boycott due to possible delays and other security concerns prompted the organizing committee to let the athletes leave the stadium at any time after marching in. Still, no one wants to seem as though they're snubbing Prince Charles or Indian royalty, plus the host nation is still sensitive about the fact that athletes exiting the ceremonies early might be construed as a slap in the face over what were admittedly substandard preparations leading up to the Games. But what do they expect when parts of New Delhi are in lockdown over concerns of terrorism and cobras are still spotted in athletic venues? Indian Army Does Rush Job To Rebuild Collapsed Footbridge Near Stadium When it absolutely, positively has to be done overnight. The New Head Of USATF? Bill Schmidt, Former VP Of Gatorade, Javelin Bronze Medallist In 1972, Would Accept USATF Job The board wants someone who knows something about the sport and has sports marketing experience. Schmidt meets the criteria. Mary Wittenberg Talks To Runner's World The interview is full of lots of great info. Galen Rupp Gets Married. Congrats to Galen and Keara. US Men's Marathon Champs: Sergio Reyes Runs 2:14:02 To Win Twin Cities And US Marathon Title Over Jeffrey Eggleston By 7 Seconds It was Reyes' first US crown and the 7 seconds for the win were worth at least an extra $10,000. Debra Buzenesh won the women's title in 2:27:23, winning by nearly 8 minutes as she got the win here to go with her win in Grandma's. Women: #13 Colorado went 1-2-3-4 overall and nearly got a Shootout shutout in the D1 scoring with 16 points to Wyoming's 48; Laura Tremblay was the top finisher with 20:29 (5.8k). In non-D1, Adams State (#1 D2) squeaked by Western State (#8 D2) with a 31-38 score; Kristin McGlynn led Adams with a division win in 20:56 (5th in all divisions). Men: Meshack Koyiaki (Columbus St. - #23 D2) led 11 others under 24:00 in the fast Gold race with a 23:21 win. *Men's Gold Results *Men's Blue Results *Message Board: louisville xc course Inevitable discussion about course accuracy. The Gold race did include some athletes with solid credentials, like former NCAA steeple champ Barnabas Kirui. *Recap Of Oregon Win From Ducks Website Vin was pleased with the performances. Beppu-Oita Marathon Officially Accepting Female Applicants Women only participated in the race by special invitation in the past. *Indian Government May Snub Prince Charles From Opening Games Because Queen Didn't Come For First Time Since 1966 The Queen is 84 and decided not to come and the Indians feel slighted. It's Official - European Marathon Champ Viktor Röthlin Is Running ING New York City Marathon We reported that Röthlin was running two weeks ago but it's official now. He leads the European charge, which also includes French national record holder Christelle Daunay.